One of the most popular American cars ever made was the 1957 Chevrolet. 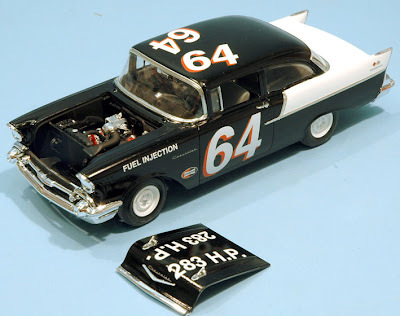 The US ‘Big Four’ in the model car field - AMT, Monogram, MPC and Revell - have each made their own kits of the ’57, some dating from decades ago, which have been issued, reissued, and modified over the years. 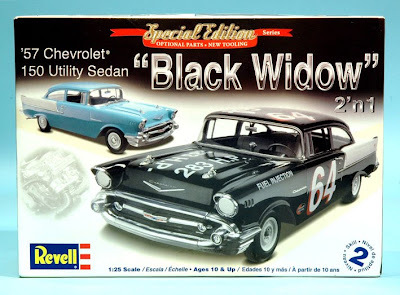 So why has Revell come up with a brand-new 1:25 scale 1957 Chevy kit? It’s mainly because previous models have featured the top-end Bel Air version; this new one is the exact opposite, the entry-level 150 Utility Sedan. The 150 was more the sort of car you would take racing, rather than the top-of-the-range Bel Air, and it was also the cheaper model that Joe Public would drive, and was often used by travelling salesmen with the back seat removed, to leave more room for samples. 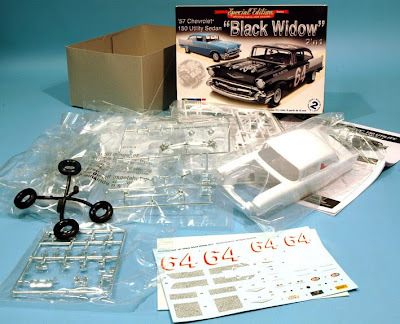 This Revell 2’n1 kit comes with optional parts that allow either stock or race-ready versions to be built, the racer dubbed ‘Black Widow’, reflecting a popular showroom scheme of mostly black with white rear quarter-panels and trunk (‘boot’ to UK readers). 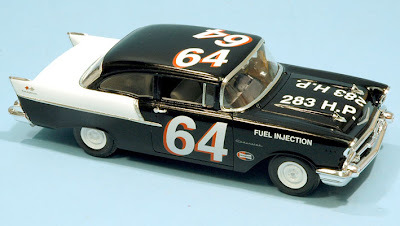 Among the changes made by Chevrolet for the Black Widow were to install a 233 cu in fuel-injection engine, add an internal roll bar, leave off the wheel embellishers and wipers, and fitting covers over the headlamps - and these parts are supplied by Revell for the kit, as is the simple racing numbers scheme. Modern model touches include decals for the interior door panels and seat patterns, and separate chrome-plated door handles - in earlier years these were usually moulded into the bodywork. The ‘V’ emblem Chevy used at that time can either be applied as a decal along with the word ‘Chevrolet’, or they are supplied as separate chromed parts. The interior of the model I built for this review was finished in Humbrol paints, mostly shades of grey. For the exterior, I used Testors spray paints - Classic White for the white bits, and the new black lacquer for the, well, you can probably work that out. When these coats were thoroughly dry, the whole car was finished off with Testors High Gloss Clear.